The topic of "biblical womanhood" is what we could deem a "hot button" topic in certain circles of Christian culture. While many books, conferences, speakers, and pastors have spent a great deal of time and energy encouraging Christian women to pursue "biblical womanhood," the concept itself has also generated a great debate and begs the question: What does the Bible really say about being a woman of faith? Rachel Held Evans, in the introduction to her new book A Year of Biblical Womanhood (Thomas Nelson, 2012), considers how frequently the topic of "biblical womanhood" has come up in conversations with fellow Christian women and at church gatherings. Because of those experiences, she decided to set out on a mission to attempt to live out the biblical mandates for women as literally as possible for one year. In her introduction, she reflects on the questions that were at the forefront of her mind as she first considered the project: "Could an ancient collection of texts, spanning multiple genres and assembled over thousands of years in cultures very different from our own, really offer a single cohesive formula for how to be a woman? And do all the women of Scripture fit into the same mold? Must I?" (xvi). Thus began Held Evans' quest to live out the biblical mandates for women, which she actually turns into a formula-based plan. She sets out with Ten Commandments that guide her daily living throughout the year. Subsequently, she also takes on a different virtue each month. She chooses virtues that she feels are key to living out "biblical womanhood," some of which include gentleness, domesticity, justice, and submission. While the plan seems pretty straightforward from the book's introduction, the results are anything but predictable. In an attempt to cultivate the virtue of motherhood, Held Evans cares for a robot baby named Chip. In another part of the year, Held Evans attempts to follow the biblical laws concerning women and menstruation, which results in sleeping in a tent in the front yard. From headscarves in the spring, to apple pie at Thanksgiving, to Bolivia in the summer, Held Evans embarks on a journey that is anything but ordinary. The book reads like part memoir, part self-help book, part spiritual guide. While Held Evans spends each chapter relaying her experiences for the particular month and topic at hand, she also concludes each chapter highlighting a different woman of the Bible, retelling her story and reflecting on her impact on the definition of "biblical womanhood." Held Evans notes at one point in the book that when people heard the premise of her project, some thought she was planning to merely condemn complementarians, while others thought she was a religious radical taking the Bible too literally. To the first point, Held Evans, while critical of some of the perspectives found within complementarian teaching, is in no way setting out to merely condemn complementarians. One of the great aspects of the book was Held Evans' willingness to step outside her own evangelical faith perspective. She visits various Christian communities, including a Friends meeting and a monastery, and she interviews a wide range of people—from a member of the Quiverfull movement to an Orthodox Jewish woman—all to wrestle with what "biblical womanhood" means. Held Evans certainly does her homework, but the book does not read like a research paper. She begins the book relaying the experience of telling her hairstylist about her year of biblical womanhood. For the reader, A Year of Biblical Womanhood is like listening in on that conversation. Like stories we often tell about our lives, it is filled with moments of humor, frustration, joy, and sadness. I personally had trouble putting the book down. As to the charge of taking the Bible too seriously, Held Evans does take the Bible seriously. It is apparent that she is passionate about the Bible and how it relates to gender expectations. While A Year of Biblical Womanhood is not a thorough exegetical look at the biblical passages about women's role in the church and home, Held Evans does dive into the context of complex passages, quoting biblical scholars and commentaries in ways that flow seamlessly with her conversational tone. In her unique style, she demonstrates that the Bible has the potential to intensely impact our own personal faith journeys in unexpected, beautiful ways. While not wanting to give too much away, Held Evans discovers that "biblical womanhood" is not a one­size fits all scenario. 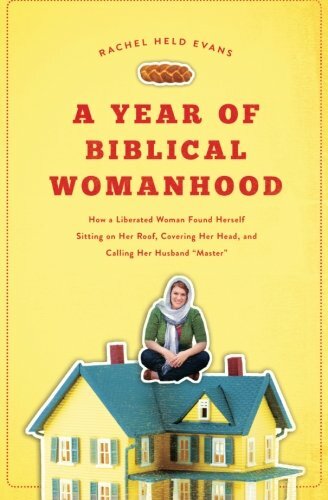 Because Rachel Held Evans did not have a clear definition of "biblical womanhood" in mind when she began her project, I would recommend her book to those new to notions of "biblical womanhood," or for those wondering about the connection between gender and the Bible. Unlike most books in this genre, A Year of Biblical Womanhood will have appeal to those who may not consider themselves Christians. But I also recommend the book to the many of us who are familiar with evangelical culture. For those of us who may have heard the phrase "biblical womanhood" in youth group or church sermons for most of our lives, who have felt like we did not understand what it means, or worse, who have had hurtful experiences of feeling like we didn't fit the mold, this book has the potential to be a real source of healing and reconciliation. One thing becomes clear in reading A Year of Biblical Womanhood: to be a woman of valor does not require fitting a particular mold. Rather, it requires a heart willing to seek God and cultivate virtues found throughout Scripture. A special gem that readers may take from the book is that while Held Evans focuses on "biblical womanhood," her attempts to live out the virtues in Scripture could teach a great deal to men and women alike. As one of my former professors used to say, "The fruit of the Spirit do not come in pink and blue." Held Evans' book is filled with honesty, humor, and grace, and her book is a great tool to begin, or continue, conversing about what "biblical womanhood" means for us all.